At the heart of the D3200 is its headline-grabbing, 24.2-million-pixel, APS-C CMOS sensor. The 23.2 x 15.4mm sensor has an output of 6016 x 4000 pixels, enabling 300ppi prints of approximately 20 x 13.3in. This matches the output of the best APS-C sensor currently available, which is used in the Sony Alpha 65, Alpha 77 and NEX-7. Using full-resolution, 12-bit raw+JPEG capture, a 4GB card is full after approximately 125 shots. Nikon is keen to illustrate that such large files enable the cropping of images while maintaining enough quality to produce a good level of detail. There are no cropped formats in-camera, however, just smaller JPEG formats. 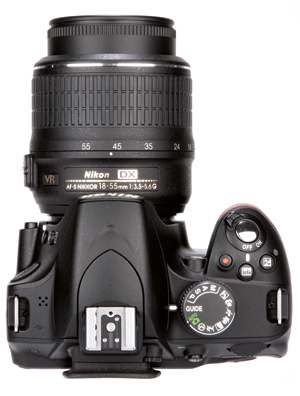 Like the Nikon 1 cameras and the professional Nikon D4, the D3200 features the company’s latest Expeed 3 processor, which provides high-speed operation and enhanced image processing. Using a high-speed UHS-I SD card, the continuous frame rate of the D3200 reaches 4fps for a five-frame burst, after which the buffer takes 7secs to fully clear and enable another full-performance burst. The entry-level D3100 has a 3fps burst. Like the D3100, though, the D3200 has a guide mode to walk beginners through some photographic basics. This time around the guide has been enhanced and expanded for more in-depth advice, and is positioned on the shooting-mode dial for quick access. It includes three main menus: shoot, view/delete and set-up. In the shoot menu there are advanced operation guides for nine different scenarios. These explain which exposure setting should be adjusted for the given scene, which is linked to the current exposure settings on the camera and what lens is attached. There are some neat accessories available separately for the D3200, including the ME-1 microphone and the WU-1a wireless mobile adapter. The ME-1 is attached via the external microphone input for improved audio quality over the in-camera microphone. The WU-1a is a USB dongle for wireless communication between the camera and a smart mobile device, enabling wireless file transfer and remote camera control.